In a medium bowl beat the two eggs until blended. Stir in contents of potato pancake mix package. Allow batter to thicken for about 4 minutes. Using a tablespoon, scoop out batter and place in well greased mini muffin tray. Bake on 350' for about 20 to 25 minutes until edges are slightly crispy. 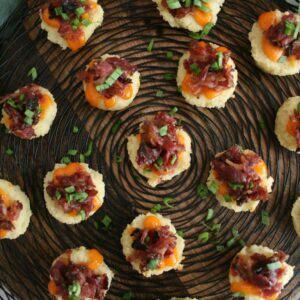 Serve with spicy mayo and crispy beef bacon bits. Allow beef bacon to come to room temperature then place on baking sheet lined with parchment paper. Cook on 350' for about 15 to 20 minutes. Once cooked cool off then cut into strips or little pieces using kitchen scissors. Nina Safar is the foodie behind www.kosherinthekitch.com. Browse the site for deliciously easy dinner ideas and cooking inspiration.